Pictured are, from left, Martha Manning, Moderator of PWST from Northumberland Presbytery; Joyce Johnson, Treasurer of PWST, Kiskiminetas Presbytery; Linda Paterni, FWM Pittsburgh; and Nancy Pryor and Nellie Baker from Washington, the sponsoring Presbytery. 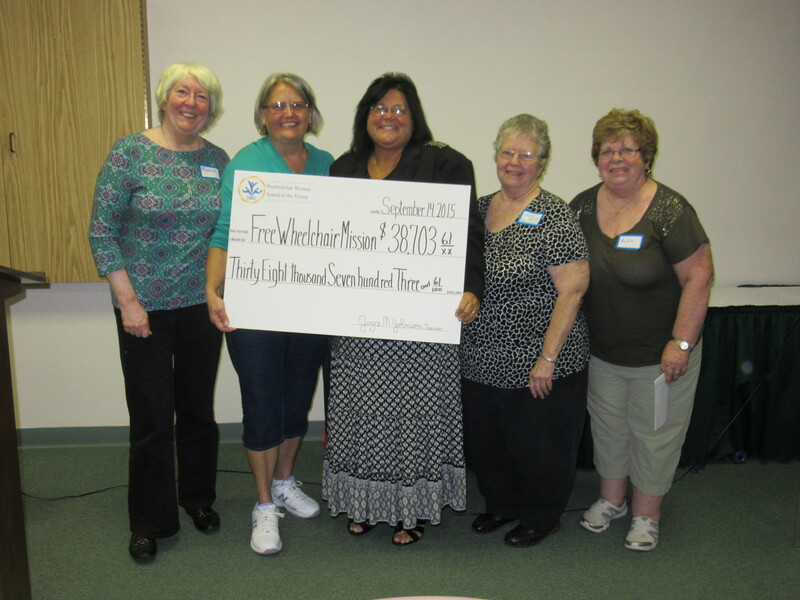 The Presbyterian Women in the Synod of the Trinity (PWST), which includes Pennsylvania, West Virginia and the Upper Ohio Valley, presented a gift to the Free Wheelchair Mission at its Sept. 14 business meeting. Each year the women select a mission project for the Synod, alternating between international and domestic projects. The 2014-15 project raised $38,703.61. Free Wheelchair Mission (FWM) is a humanitarian, faith-based, nonprofit organization that provides wheelchairs at no cost to people with disabilities living in developing nations.